I devoted a whole post to leadoff hitters, whether justified or not, so it's only fair to have a post about hitting by batting order position in general. I certainly consider this piece to be more trivia than sabermetrics, since there’s no analytic content. The seven year run of NL #3 hitters as the best position in baseball was snapped, albeit by an insignificant .01 RG by AL #3 hitters. Since Mike Trout’s previous career high in PA out of the #3 spot was 336 in 2015 and he racked up 533 this year, I’m going to give full credit to Trout; as we will see in a moment, the Angels’ #3 hitters were the best single lineup spot in baseball. #2 hitters did not outperform #5 in both circuits as they did last year, just the AL. 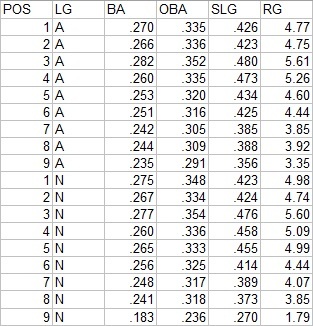 However, the NL made up for hit by having their leadoff hitters create runs at almost the exact same rate as their #5s. A couple things that stood out to me was St. Louis’ dominance at the bottom of the order and the way in which catchers named Perez managed to sabotage lineup spots for two teams. Apologies to Carlos Beltran (the real culprits for the poor showing of Texas #3 hitters were Adrian Beltre, Prince Fielder, and Nomar Mazara) and Luis Valbuena (Carlos Gomez and Marwin Gonzalez). The case of San Diego’s cleanup hitters deserves special attention. Yangervis Solarte was actually pretty good when batting cleanup, as his .289/.346/.485 line in 289 PA compares favorably to the NL average for cleanup hitters. The rest of the Padres who appeared in that spot combined for 399 PA with a dreadful .187/.282/.336 line. Just to give you a quick idea of how bad this is, the 618 OPS would have been the eleventh-worst among any non-NL #9 lineup spot in the majors, leading only 6 AL #9s, 2 #2s, a #7, and the horrible Oakland #2s. It was also worse than the Cardinals’ #9 hitters. Joe Mauer himself wasn’t that bad, with a 799 OPS when hitting third. That’s still well-below the AL average, but not bottom ten in RAA bad without help from his friends. I will try to make this as clear as possible: the statistics are based on the players that hit in the #1 slot in the batting order, whether they were actually leading off an inning or not. It includes the performance of all players who batted in that spot, including substitutes like pinch-hitters. Listed in parentheses after a team are all players that started in twenty or more games in the leadoff slot--while you may see a listing like "COL (Blackmon)" this does not mean that the statistic is only based solely on Blackmon's performance; it is the total of all Colorado batters in the #1 spot, of which Blackmon was the only one to start in that spot in twenty or more games. I will list the top and bottom three teams in each category (plus the top/bottom team from each league if they don't make the ML top/bottom three); complete data is available in a spreadsheet linked at the end of the article. There are also no park factors applied anywhere in this article. Again, no park adjustments were applied, so the Rockies performance was good but it wasn’t really “best in the NL good”. I’m also going to have a hard time resisting just writing “Esky Magic” every time the Royals appear on a trailers list. Esky Magic. And once again Billy Burns chipping in to Oakland’s anemic showing and of course Kansas City just had to have Billy Burns. The next statistic is what I call Runners On Base Average. The genesis for ROBA is the A factor of Base Runs. It measures the number of times a batter reaches base per PA--excluding homers, since a batter that hits a home run never actually runs the bases. It also subtracts caught stealing here because the BsR version I often use does as well, but BsR versions based on initial baserunners rather than final baserunners do not. Here ROBA = (H + W + HB - HR - CS)/(AB + W + HB). Kansas City leadoff hitters finished tied for last in the majors with five home runs (with Miami), so Esky Magic was only good for 23rd place. Twins leadoff hitters, thanks primarily to Dozier, led the majors with 39 homers. So only after around 25.6% of leadoff hitter plate appearances did they actually wind up with a runner on base. Their .320 OBA was well-below average too, but again ROBA describes how an offense plays out--other considerations are necessary to determine how good it was. This speaks more to me than the measure, but the most interesting thing I learned from that list was that Travis Jankowski was San Diego’s primary leadoff hitter (71 games). Looking at the rest of the list, I think I could have guessed most team’s in two or three, I never would have gotten the Padres. The Orioles certainly had a non-traditional leadoff profile thanks mostly to Jones; their five stolen base attempts was the fewest of any team, they were tied for third with 30 homers, and they drew 20 less walks than an average team out of the leadoff spot. The Indians are a good example of why I list all players who had at least twenty starts in the leadoff spot; AL steal leader Rajai Davis’ 69 games leading off led to them leading the AL in net steals. The same six teams make up the leaders and trailers, which shouldn’t be a big surprise. Allow me to close with a crude theoretical measure of linear weights supposing that the player always led off an inning (that is, batted in the bases empty, no outs state). There are weights out there (see The Book) for the leadoff slot in its average situation, but this variation is much easier to calculate (although also based on a silly and impossible premise). Esky Magic. Lest anyone think I am being unduly critical of Escobar's performance (he did after all start only half (actually 82) of KC's games as the leadoff hitter), note that Escobar when in the #1 spot hit .242/.272/.289. The rest of the Royals combined for .274/.317/.378, which would only rank second worst in the majors in 2OPS. So the Royals team performance was terrible, but Escobar was dreadful. Just the worst. 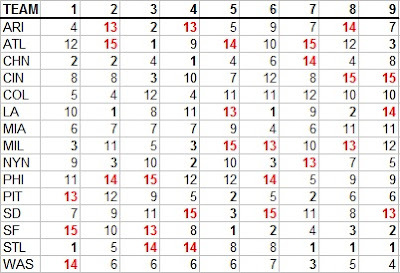 The spreadsheet with full data is available here. 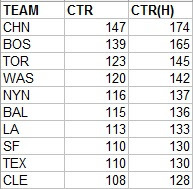 * The top ten teams in MLB in W% were the playoff participants. The top six were the division winners. A rare case in which obvious inequities aren't created by micro-divisions, in stark constant to 2015's NL Central debacle. * In the NL, only Washington (.586) had a better overall W% than Chicago's road W% (.575). Of course, the Cubs were a truly great team, and with 103 wins and a world title on the heels of 97 wins a year ago, they belong in any discussion of the greatest teams of all-time. In Baseball Dynasties, Eddie Epstein and Rob Neyer used three years as their base time period for ranking the greatest dynasties. Another comparable regular season in 2017, regardless of playoff result, would in my opinion place the Cubs forwardly on a similarly-premised list. Most impressive about the Cubs is that despite winning 103, their EW% (.667) and PW% (.660) outpaced their actual W% of .640. 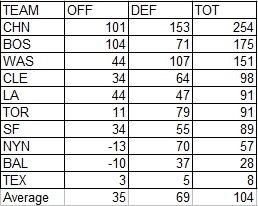 This is another way to show just how great the Cubs were--only two other playoff teams were as many as 80 RAA on either side of the scorecard and the Cubs were +101 offensively and +153 defensively. * The Twins have a multi-year run of horrible starting pitching, and 2016 only added to the misery. Only the Angels managed a worse eRA from their starters (5.61 to 5.58); only A's starters logged fewer innings per start among AL teams (5.39 to 5.40); and the Twins were dead last in the majors in QS% (36%). In their surprising contention blip of 2015, the Twins were only in the bottom third of the AL in starting pitching performance, but in 2014 they were last in the majors in eRA, second-last in IP/S (ahead of only Colorado and QS%; in 2013 they were last in all three categories; and in 2012 they were last in the majors in eRA and second-last in IP/S and QS%. * There were a lot of great things from my perspective about the 2016 season from a team performance perspective, chiefly the Indians winning the pennant and playoffs in which the lesser participants did not advance their way through. Both were helped along by the comeuppance finally delivered to the Royals. It wasn't quite as glorious as it might have been, as they still managed to scrap out a .500 record, but the fundamental problems with their vaunted contact offense were laid bare. KC was easily the lowest scoring team in the AL at 4.05 R/G, with the Yankees of all teams second-worst with 4.19. They were last in the majors with .075 walks/at bat (COL, .084 was second worst). They were last in the AL in isolated power by 12 points (.137) and beat out only Atlanta and Miami, edging out the 30th-ranked Braves by just .007 points. Combining those two, their .212 secondary average was sixteen points lower than the Marlins for last in the majors. But they were at the AL average in batting average at .257, so that's something. * Andrew Miller averaged 17.1 strikeouts and 1.3 walks per 37.2 plate appearances (I use the league average of PA/G for to rest K and W rate per PA on the familiar scale of per nine innings while still using the proper denominator of PA). If you halve his K rate and double his walk rate, that's 8.6 and 2.6, which is still a pretty solid reliever. A comparable but slightly inferior performer this year was Tony Watson (8.2 and 2.8). * Boston's bullpen was built (or at least considered by some preseason) to be a lockdown unit with Tazawa, Uehara, and Kimbrel. Tazawa had a poor season with 0 RAR; Uehara and Kimbrel missed some time with injuries and were just okay when they pitched for 10 RAR each. Combined they had 20 RAR. Dan Otero, a non-roster invitee to spring training with Cleveland, had 26 RAR. * Matt Albers (-18) had the lowest RAR of anyone who qualified for any of my individual stat reports. I don't think that save is very likely at this point. The correct answer from A to E is Dickey, Sanchez, Stroman, Estrada, Happ. I never got a chance to play this game without being spoiled, but I'm certain that I would have at least said that Aaron Sanchez was pitcher D.
* Jameson Taillon made it to the majors at age 25, and the thing that jumped out at me from his stat line was his very low walk rate (1.5, lower than any NL starter with 15 starts save Clayton Kershaw and Bartolo Colon. note that Taillon just cleared the bar for inclusion). John Lackey, at age 38, chipped in 49 RAR to Chicago (granted, fielding support contributed to his performance). Taillon and Lackey are always linked in my head thanks to a Fangraphs prospect post from several years ago that I will endeavor to find. I believe the Fangraphs writer offered Lackey as a comp for Taillon. A commenter, perhaps a Pittsburgh partisan, responded by saying it was a ridiculous comparison, essentially an insult to Taillon. My thought at the time was that if I had any pitching prospect in the minors, and you told me that if I signed on the dotted line he would wind up having John Lackey's career, I would take it every time. That's not to say that there aren't pitchers in the minors who won't exceed Lackey's career, but to think that it's less than the median likely outcome for any pitching prospect is pretty aggressive. And this was before Lackey's late career performance which has further bolstered his standing. What odds would you place now on Jameson Taillon having a better career than John Lackey? * Jeff Francoeur had exactly 0 RAR. Ryan Howard had 1, before fielding/baserunning which would push him negative. * It wouldn't be a meanderings post without some Indians-specific comments. It has actually been harder than usual to move on to writing the year-end posts because of the disappointment of seeing the Indians lose their second, third, and fourth-consecutive games with a chance to close out the World Series. Three of those losses have come by one run and two in Game 7 in extra innings. The Indians have now gone 68 seasons without winning the World Series, losing four consecutive World Series after winning the first two in franchise history. That now matches the record of the Red Sox from 1918 - 1986, which if Ken Burns' "Baseball" and plagiarist/self-proclaimed patron saint of sad sack franchises Doris Kearns Goodwin are to believed was a level of baseball fan suffering unmatched and possibly comparable to the Battle of Stalingrad. Well, except for the initial two World Series winning streak--Boston won their first four World Series. The two Cleveland notes I have are negative, which is only because I have been thinking about them in conjunction with Game 7. One is how bad Yan Gomes was this season, creating just 1.9 runs per game over 262 PA, dead last in the AL among players with 250 or more PA. I did not understand Terry Francona's decision to pinch-run for Roberto Perez with the Indians down multiple runs in the seventh inning. He must have felt that a basestealing threat would distract Jon Lester, but given the inning and the extent of Cleveland's deficit, it basically ensured that Gomes would have to bat at some point. And bat he did, with the go-ahead run on first and two outs in the eighth against a laboring Chapman who had just coughed up the lead. Also costly was the decision to bring Michael Martinez in to play outfield in the ninth. That move made more sense given Coco Crisp's noodle arm, but to see Martinez make the last out was a tough pill to swallow (and had Martinez somehow reached base, Gomes would have followed). And don't even get me started on the intentional walks in the tenth inning. * For various reasons, a few of the players who were in the thick of the NL MVP race a year ago and were surely considered favorites coming into this season had disappointing seasons. These three outfielders (Bryce Harper, Andrew McCutchen, Giancarlo Stanton) all wound up fairly close in 2016 RAR (28, 27, 23 respectively), yielding the MVP center stage to youngsters (Kris Bryant and Corey Seager), first basemen (Freddie Freeman, Anthony Rizzo, Joey Votto) and a guy having a career year (Daniel Murphy). More interestingly, those big three outfielders combined for 78 RAR--five fewer than Mike Trout. And then I stopped and concluded, “You idiot, don’t you dare write that.” This is exactly the kind of banal over-extrapolation of heavily selected data that I rail against constantly. In the long run, is it possible that those factors could contribute to a dilution of clear Cy Young candidates, leaving voters to comb over a pack of indistinguishable guys pitching 180 innings a year? Entirely possible. Does that make 2016 the new normal? Of course not. Just last year, there was an epic three-way NL Cy Young race. This year, only an injury to Clayton Kershaw seems to have stood in the way of a historic season and Cy Young landslide. In the AL race, Justin Verlander had a 70 to 61 RAR lead over Chris Sale, with a pack of pitchers right behind them (Rick Porcello 59, Corey Kluber 58, Jose Quintana 57, Aaron Sanchez/JA Happ/Masahiro Tanaka 56). Convieniently, the first four in RAR also are the only pitchers who would also have 50 or more RAR based on eRA or dRA, with one exception. Verlander allowed a BABIP of just .261 and would so his dRA is 3.80, significantly higher than his 3.04 RRA. However, none of the others look better using dRA--all three are five to eight runs worse. So I go with Verlander for the top spot and Porcello second over Sale (he led the AL with a 3.14 eRA, and since we are talking about one run differences here, Bill James would at least want us to consider his 22-4 W-L record). I didn’t actually consider the W-L record, but he does rank just ahead of Sale if you weight RAR from actual/eRA/dRA at 50%/30%/20%, which has no scientific basis but seems reasonable enough. Again, there’s only a one RAR difference between Sale and Porcello, so using W-L or flipping a coin to order them is just as reasonable. I gave the fifth spot to Jose Quintana over Aaron Sanchez, and would not have guessed that Quintana had a better strikeout rate (8.1 to 7.8). This leaves out Zach Britton, who I credit with just 35 RAR. I remain thoroughly unconvinced that leverage bonuses are appropriate. Each run allowed and out recorded is worth the same to the final outcome regardless of what inning it comes in. The difference between starters and relief aces is that some of the games the former pitch could have been won or lost with worse or better performances, while relief aces generally are limited to pitching in close games. But the fact that Britton pitches the ninth doesn’t make his shutout inning any more valuable than the one Chris Tillman pitched in the fourth within the context of that single game. To the extent that Britton contributes more value on a per inning basis, it’s because he pitched in a greater proportion of games in which one run might have made a difference, not because that is more apparent for any particular game at the point at which Britton appears in it than it was when the starter was pitching. I have alluded to this viewpoint many times, but have never written it up satisfactorily because I’ve not figured out how to propose a leverage adjustment that captures it, without going to the extreme that value can only be generated by pitching in games your team wins. In the NL, there were seven starters with 60 RAR and then a gap of four to Jake Arrieta, which makes a good cohort to consider for the ballot. Of this group, Tanner Roark and Madison Bumgarner at the bottom in terms of RAR and had high dRAs (4.17 and 3.87) which justify dropping them. That leaves Jon Lester (71 RAR), Kyle Hendricks (70), Max Scherzer (70), Johnny Cueto (65), and Clayton Kershaw (64). If you weight 50/30/20 as for the AL, all five are clustered between 60 and 64 RAR. This makes it tempting to just to pick Kershaw as he was much the best in every rate and narrowly missed leading the league in RAA despite pitching only 149 innings. Among the four who pitched full seasons, Scherzer ranks first in innings and third in RRA, eRA, and dRA. However, he pitched significantly more innings than the Cubs candidates--25 more than Lester and 38 more than Hendricks. Comparing him to Cueto, who pitched nine fewer innings, Scherzer leads in RRA by .09 runs, eRA by .13 runs, and trails in dRA by .09 runs. So for my money Scherzer provided the best mix of effectiveness and durability. You could basically copy and paste the same thing for AL MVP every year, so I’ll try to keep it brief. My position is that wins are value, and 8 wins don’t count for more because the rest of your teammates were worth 50 than if the rest of your teammates were only worth 30. But the debate over the definition of value is not what I find most obnoxious about the Mike Trout-era MVP discussions. It’s easy enough to disagree on that point and move one. What is most bothersome is the way that people attempt to co-opt the sabermetric terms that sound sabermetric like “error bars” to push their own narratives. Let’s suppose that Player A is estimated to have contributed 87 RAR and player B is estimated to have contributed 80 RAR, and that the standard error is something like 10 runs. In this case, it certainly is inconclusive that player A was truly more valuable than player B. I would grant that player B would be a reasonable choice as MVP. But if you’re filing out your MVP ballot, *should* you put Player B ahead of Player A? It’s still quite likely that Player A was more valuable than Player B. To me, you need to have a good reason to put Player B ahead, particularly when the margin is “significant” but not beyond the “error bar”. Worse yet, though, is the attempt to twist oneself into a pretzel to make up those good reasons. The real gem going around, which you will see in comment sections and message boards, is that the error bars must be larger for Player A. Because you see, Player A’s park became a strong pitcher’s park right around when he arrived, and parks don’t change character like that (says someone who has never examined historical park factors). Because you see, Player A always leads the league in RAR, and by a wide margin--that just can’t be right. Player A is so consistently great in the metrics that the metrics must be wrong. The world is not worthy of Player A. Every week of Player A’s career is scrutinized by pseudo-sabermetricians who have deadlines to fill with their micro-analytical pablum, and who when they aren’t vulturing over Player A are busy writing extrapolating trends from blips in thirty-team samples to blame metrics for their own arrogance. Player A can’t win with the people who should be appreciating him--not in the sense that a fan might but exactly in the sense that a detached analyst would. I’m sure you’ve deduced by now that Player A is Mike Trout, and you may have guessed that Player B is Mookie Betts. 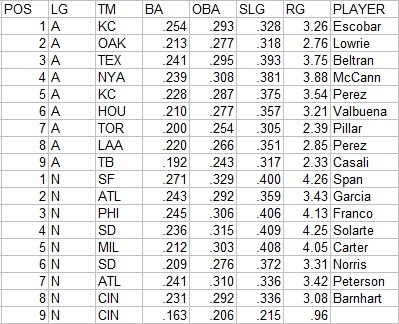 Except those aren’t even my true estimates of their RAR, they’re what I would come up with their RAR if I took my hitting/position RAR + BP’s baserunning runs (for non-steals, since steals are incorporated in the first piece) + the average of each player’s BP FRAA, BIS DRS, and MGL UZR. In other words, if I didn’t regress fielding at all, which I don’t think is the correct position. When adding components together, if one (hitting) is more reliable than another (fielding), it doesn’t make sense to ignore that. In actually estimating RAR for the purpose of filling out a fake MVP ballot, I used 50% FRAA, 25% DRS, 25% UZR, and halved it. Then Trout is at 86 RAR, Betts 68, and Jose Alutve slides in between them at 71, which explains the top of my ballot. If anything, I think I may be generous to Betts, who needs all of his 8 baserunning runs and 11 “regressed” fielding runs to overcome 49 hitting RAR, which ranked just ninth in the league. Kyle Seager also made it onto my ballot on the strength of 8 fielding runs, and Francisco Lindor came close with 5 from baserunning and 10 from fielding. David Ortiz and Miguel Cabrera gave up 5 runs from non-hitting activities (or in Ortiz’s case, non-acitivty), which pushed them just off the ballot. Last year’s Player B, Josh Donaldson, was only a hair behind Betts, having another excellent season with 65 RAR and good-average fielding except in FRAA, which didn’t like his performance at all (-12). In the NL, I think Kris Bryant is a pretty clear pick for the top spot. He was second in the league in RAR by just one run to Joey Votto, which he makes up with baserunning alone and pads with strong fielding runs (2, 10, 12). Anthony Rizzo seems to be the other top candidate in mainstream opinion, but he only ranks third among first baseman on my ballot. Rizzo, Freddie Freeman, and Joey Votto all had similar playing time, but both significantly outhit him (Rizzo 6.9 RG, Votto 8.2, Freeman 7.6). Rizzo makes up much of the ground on Votto with his glove, but Freeman is no slouch himself. It was a bad year for rookies in the AL, made more interesting by the very late arrival of Gary Sanchez. Most of the discussion about the award seems to center around whether it is appropriate to give it to Sanchez based on his brilliant 227 PA, and whether ROY should be a value award, a future prospect award, or some kind of ungodly hybrid of the two. My own approach is that it should be a value award--anyone who is a rookie should be eligible and my primary criteria is how productive they were in 2016, not how old they are, their prospect pedigree, how their team held down their service time, or the like. Only in a very close decision would I factor in those criteria. I understand why others might consider those factors, and why it makes a lot more sense to deviate from a value approach for ROY than for Cy Young or MVP. As such, I don’t consider Sanchez’s case to be particularly compelling. Yes, Sanchez was more productive on a rate basis than any AL hitter other than Mike Trout. Yes, the lack of a standout candidate in the rest of the league makes Sanchez all the more appealing. But Sanchez’s performance far outpaced both his prospect status and his minor league numbers (807 OPS in 313 PA at AAA this year, 815 across AA and AAA last year). If I was going to consider a shooting star exception, it would be for someone who checked all the boxes. I would much rather have Sanchez’s future than any of the other four players on my ballot, but in 2016 he fell in the middle in terms of value. With Sanchez out, the top of the ballot comes down to Michael Fulmer, who is the top non-Sanchez candidate in the popular discussion, and Chris Devenski. I watched a game in which Devenski pitched this year and was vaguely aware of his existence in subsequent box scores, but how effectively he was pitching completely escaped my attention until I put together my annual stat reports. Devenski pitched extremely well for Houston, mostly in relief (48 games, 5 starts) with a 1.80 RRA over 108 innings. His peripherals were strong as well (2.39 eRA and 2.79 dRA). Fulmer pitched 159 innings with a 3.41 RRA for 42 RAR versus Devenski’s 39. Fulmer’s peripherals were also reasonably strong (3.46 eRA, 4.02 dRA), and since this was a curious case I also checked Baseball Prospectus’ DRA, which attempts to normalize for any number of relevant variables (park, umpires, defensive support, framing, quality of opposition, etc.). Using DRA, Fulmer has a clear edge considering his quantity advantage (3.49 to 3.72). One thing my RAR figures oversimplify is pitcher’s roles--it is a binary reliever (with replacement level at 111% of league average) or start (replacement level 128% of league average). If I figured RAR using Devenski’s inning split to set his replacement level (83 innings in relief to 24 starting works out to 115% of league as the replacement level), his RAR would edge up to 41. It should be noted too that Devenski pitched decently in his five starts, averaging just under 5 innings with a 4.01 RA. I think the two are very close; this is a case where Fulmer’s status as a starter and a younger, better regarded prospect leave him just ahead for me. Even so, I assume Devenski will rank higher on my ballot than almost any submitted even for the IBAs. Filling out the bottom of the ballot, the only other legitimate hitting candidate, Tyler Naquin and his 26 RAR, was heavily platooned and fares poorly in defensive metrics. That leaves two A’s pitchers, one a starter and one a reliever. If I strictly followed RAR, I would actually have the latter (Ryan Dull) ahead of the former (Sean Manaea), and the peripherals don’t really help either’s case, but since they were so close I will vote here for prospect status. For all of the player reports, ages are based on simply subtracting their year of birth from 2016. I realize that this is not compatible with how ages are usually listed and so “Age 27” doesn’t necessarily correspond to age 27 as I list it, but it makes everything a heckuva lot easier, and I am more interested in comparing the ages of the players to their contemporaries than fitting them into historical studies, and for the former application it makes very little difference. The "R" category records rookie status with a "R" for rookies and a blank for everyone else; I've trusted Baseball Prospectus on this. Also, all players are counted as being on the team with whom they played/pitched (IP or PA as appropriate) the most. I say “generally” since this year, the team I am a fan of (Cleveland) lost two key starting pitchers, and I wanted to account for that in the ratings. While other teams have injuries of note as well, I did not consider those. This approach is basically being as conservative as reasonably possible in estimating the Indians strength. Using a runs allowed approach (and not adjusting for bullpen support and park factor because I haven’t had time to dig into the numbers yet) Carlos Carrasco and Danny Salazar combined for about 5.9 WAR, which over 161 games is a .037 hit to the Indians’ W%. Of course, the real impact is not necessarily equal to the WAR impact; generic replacements don’t apply and the impact of starting pitchers in the playoffs can be muted. Still, this adjustment is better than nothing. I should also note that not park adjusting is mildly conservative since Cleveland tends to be a pitchers park. One thing to note here is just how good Boston is assumed to be; they were excellent in the W% estimators. The Cubs were even better in each of those metrics their 103 wins would suggest, but the Red Sox close the gap on strength of schedule, 104 to the Cubs’ 93 (implying that Boston’s average opponent would have a .528 W% against Chicago’s average opponent). With the injury adjustment the Indians are the weakest team on paper, but not so much so that they have significantly lower odds (last year, the Mets at 104 were the lowest-rated team and we know how that worked out). 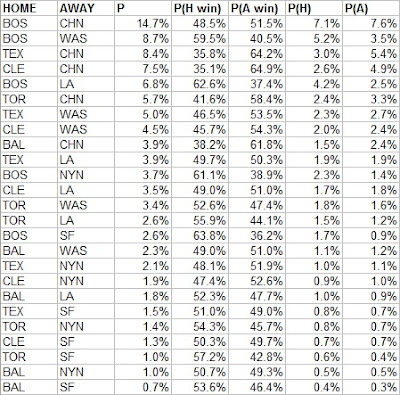 Since we’re assuming the home team wins 54.2%, there’s very little difference in assumed strength in these two matchups (of course, the Mets suffer from even more extreme pitching maladies than do the Indians). 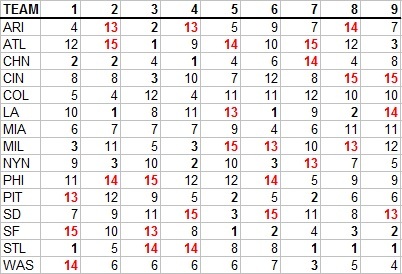 In the charts that follow, “P” is the probability that the series occurs; P(H win) is the probability that the home team wins should the series occur; and P(H) is the probability that the series occurs and that the home team wins [P*P(H win)]. My guess, based on no calculations but including my inherent knowledge of the team’s statistical records and characteristics, was that Cleveland would have a 45% chance against Boston. So strike one for homerism there. Texas/wildcard figures will be the closest DS matchup on paper, although I’m most eager to see WAS/LA (other than the Indians, of course). You’ll note that the Cubs have a higher probability against stronger teams than they do in the NLDS thanks to the extra games. 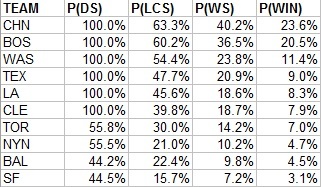 Cubs/Dodgers is the most lopsided potential LCS, while Dodgers/Mets is the closest. 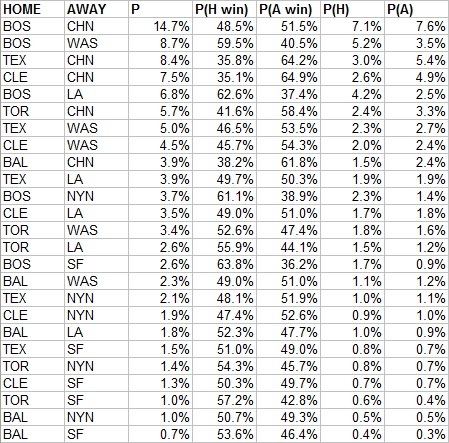 The AL is favored in 13 of the 25 possible matchups, but 13 of 20 that don’t involve Chicago. It doesn’t help the stronger circuit that it’s two highest seeds have the two lowest CTRs in the field. This gives the NL a 51.1% chance to win, a 84% chance of an outcome I like, a 79% chance of an outcome I really like, and a 7.9% chance of an outcome that would be the best thing that’s ever happened in baseball. Plus a 100% of being a better outcome than 2015. This post is going to lay out the math necessary to apply the so-called "Willie Davis method" of Bill James to his Runs Created and to Base Runs. The last three posts have explained how you can use it with Linear Weights. This is offered in the interest of comprehensiveness, should you decide that you’d like to fiddle with this stuff yourself. The Willie Davis method as explained by Bill James is based on the most basic RC formula, (H + W)*TB/(AB + W). You could use one of the technical RC versions too, of course, but then you would introduce the problem of what to do with all of the ancillary categories that are included in those versions. A minor modification that would help matters is to give a weight to walks in the B factor (which is simply TB in the basic version), but James has never done that as it would complicate the basic version and mess up all of the neat little RC properties like OBA*SLG*AB = runs. While I tried to emphasize that I wouldn’t take any of the results from the linear weight translations too seriously, the output of the Willie Davis method is actually used by Sean Forman to calculate OPS+ at baseball-reference.com. So while James used it in the vein that I advocate, Forman uses it to park-adjust the most-looked at total offensive statistic at his site. 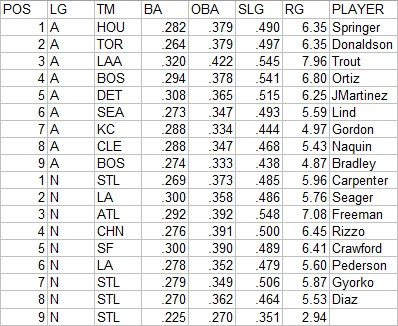 For this reason, I’ll compare park-adjusted OPS+ figured by his method to what I would do later in the post. The adjustment factor for all of the basic components (S, D, T, HR, W with outs staying fixed) is simply H'/H. So we multiply the positive events by H'/H and the result is a translated batting line. S'/S is then the multiplier for all of the positive events. So we have three different approaches based on three different run estimators to accomplish the same task. Which one should be used? Unfortunately, there’s no good empirical way to test these approaches; the entire point of having them is to make estimates of equivalent value under different conditions…i.e. conditions that did not occur in reality. However, I think it should be self-evident that the quality of the model from which the estimate is derived says a lot about its value. I don’t need to beat that horse again, but it is well-known that Basic RC is not a very good estimator when applied to individuals, which is exactly what we are doing here. It would also follow that the Linear Weights-based approach should be marginally better than the Base Runs-based approach since BsR should not be applied directly to individuals. Since BsR is better constructed than RC, though, the discrepancies shouldn’t be as bothersome. From eyeballing the numbers, I’d say that there is a strong degree of agreement between the ERP and BsR estimates, with the RC estimates as the outliers. As mentioned above, this is along the lines of what I would have expected to see, as both ERP and BsR are better models of the run scoring process than RC. That the ERP and BsR results are close should not come as a surprise, as both estimators give similar weight to each event. Using RC results in a less severe park adjustment for most players. Why is this? My guess is that it is because RC, with it’s well-known flaw of overvaluing high-end performance, naturally needs to draw down the player’s OBA and SLG less then ERP or BsR to still maintain a high performance. In other words, RC overestimates Larry Walker’s run contribution to begin with, and since the problem only gets worse as OBA and SLG increase, it doesn’t take that that big of a change in OBA or SLG to reduce run value by X%. As I mentioned earlier, I think it is worth looking at the Willie Davis method closely since some sources (particularly Baseball-Reference) use it for serious things like park-adjusting OPS+. This is in contrast to the position of its creator, Bill James, who presented it more as a toy that yields a rough estimate of what an equal value performance would look like in a different environment. The first column of the table, "unadj" uses the player’s raw stats with no park adjustment. The second column, "trad", reflects the traditional method of figuring OPS+ used by Pete Palmer in The Hidden Game of Baseball, Total Baseball, and the ESPN Baseball Encyclopedia: simply divide OPS+ by the runs park factor (1.23) in this case. 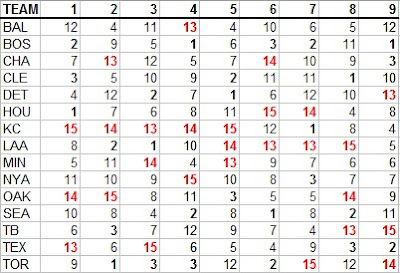 The third column, "sqrt", adjusts OBA and SLG separately by dividing each by the square root of park factor, and uses these adjusted figures in the OPS+ formula above (*). The fourth column, "reg", uses the runs factor to estimate an OPS+ park factor based on a regression equation that relates OPS+ to adjusted runs/out (this is covered in the digression as well). What can we see from this? The traditional approach is more severe than any of the Willie Davis approaches, while the square root approach is a pretty good match for the Willie Davis approaches. Thus, I suggest that the best combination of ease and accuracy in calculating OPS+ is to divide OBA and SLG by the square root of park factor, then plug the adjusted OBA and SLG into the OPS+ equation. Of course, I should point out that 1995 Coors Field and its 1.23 park factor is one of the most extreme cases in the history of the game. For run of the mill environments, we should expect to see little difference regardless of how the park adjustments are applied, and so I am NOT saying that you should disregard the OPS+ figures on Baseball-Reference (although I do wish that OPS+ would be pushed aside in favor of better comprehensive rate stats). On the other hand, though, I see no reason to use a complicated park adjustment method like the Wille Davis approach when there are much easier approaches which we have some reason to believe better reflect true value. (*) I shunted some topics down here into a digression because it covers a lot of ground that I’ve covered before and is even drier than what is above. And a lot of sabermetricians are sick and tired of talking about OPS, and I don’t blame them, so just skip this part if you don’t want to rehash it. As I’ve explained before, OPS+ can be thought of as a quick approximation of runs/out. Some novice sabermetricians are surprised when they discover that OPS+ is adjusted OBA plus adjusted SLG minus one rather than OPS divided by league OPS. And it’s true that the name OPS+ can be misleading, but it is also true that it is a much better metric. One reason is that OPS/LgOPS does not have a 1:1 relationship with runs/out; it has a 2:1 relationship. If a team is 5% above the league average in OPS, your best guess is that they will score 10% more runs. So the OPS/LgOPS ratio has no inherent meaning; to convert it to an estimated unit, you would have to multiply by two and subtract one. The other reason why OPS+ is superior is that it gives a higher weight to OBA. It doesn’t go far enough--the OBA weight should be something like 1.7 (assuming SLG is weighted at 1), while OPS+ only brings it up to around 1.2--insufficient, but still better than nothing. The slope of the line relating OPS+ to runs/out is not particularly steep, and so this is an almost negligible adjustment--for Coors Field and its 1.23 run park factor, we get a 1.217 OPS+ park factor. Now a word about the traditional runs factor v. the individual square root adjustments. Since OPS+ is being used as a stand-in for run creation relative to the league average, I would assume that the goal in choosing a park adjustment approach is to provide the best match between adjusted OPS+ and adjusted runs/out. It turns out that if you figure relative ERP/Out for the ’95 Rockies players, the results are fairly consistent with the ERP/BsR translated OPS+. Thus, I am going to assume that those are the “best” adjusted OPS+ results, and that any simple park adjustment approach should hope to approximate them. As a consequence, the square root adjustments to OBA and SLG look the best. Why is this? I’m not exactly sure; one might think that since OPS+ is a stand-in for relative runs/out, we should expect that the best adjustment approach once we already have unadjusted OPS+ is to divide by park factor. Yet we can get better results by adjusting each component individually by the square root of PF. OPS+ is far from a perfect approximation of relative runs/out, though, so it may not be that surprising that applying OPS+ logic to park factors is not quite optimal either. It is quite possible that there is a different power you could raise PF to that would provide a better match for our ERP-based OPS+ estimates, but getting any more in-depth would defeat the purpose of having a crude tool. In fact, I think that adjusting OPS+ by the Willie Davis method goes too far as well. Regardless, I would be remiss if I didn’t again emphasize that the 1995 Rockies are an extreme case, and so while the differences between the approaches may appear to be significant, they really aren’t 99% of the time.